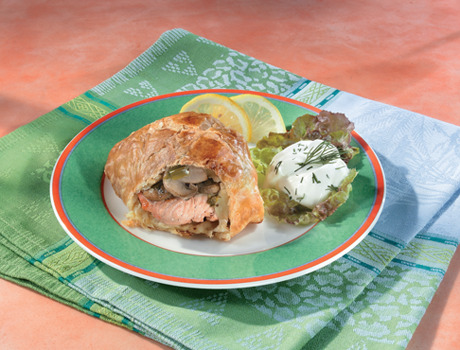 What an elegant entréesalmon fillets topped with sautéed mushrooms and green onionsserved Wellington-style in a flaky puff pastry wrapping. Drizzle the salmon with the lemon juice. Heat the butter in a 10-inch skillet over medium-high heat. Add the salmon and cook for 5 minutes or until it flakes easily when tested with a fork, turning the salmon over once halfway through cooking. Remove the salmon from the skillet. Add the mushrooms and onions to the skillet and cook until they're tender and any liquid is evaporated, stirring often. Remove the mushroom mixture from the skillet. Cover and refrigerate the salmon and the mushroom mixture for 1 hour or until chilled. Heat the oven to 400°F. Beat the egg and water in a small bowl with a fork. Carefully remove the skin from the salmon. Unfold the pastry sheet on a lightly floured surface. Roll the pastry sheet into a 14-inch square. Cut into 4 (7-inch) squares. Spoon the mushroom mixture in the center of the pastry squares. Top each with 1 salmon piece. Brush the edges of the pastry with the egg mixture. Fold the corners of the pastry up over the salmon and press to seal. Place seam-side down onto a baking sheet. Brush with the egg mixture. Bake for 25 minutes or until the pastries are golden brown. Serve the pastries with the Dilled Cream Sauce (recipe below). Dilled Cream Sauce: Stir 3/4 cup sour cream, 1 tablespoon Dijon-style mustard and 1 tablespoon chopped fresh dill weed or 1 teaspoon dried dill weed, crushed, in a small bowl until the mixture is smooth. 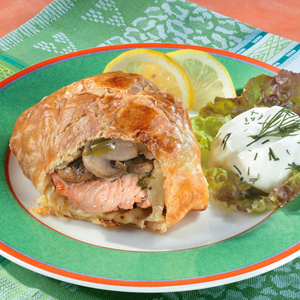 Make-Ahead: The cooked salmon and the mushroom mixture can be refrigerated for up to 24 hours. To seal stuffed Puff Pastries, pinch the edges together or press with the tines of a fork, just as you’d seal a piecrust.